Joey Dawejko had scored many knockouts prior to his wipeout of Enobong Umohette. In fact, “The Tank” rode into this fight with a three-bout KO streak - all of them in the first round. However, his immediate future was riding on this scheduled 8-rounder, and the pressure was on. Hanging in the balance was a 10-round, ESPN2 showdown with Amir Mansour for the PA state heavyweight title. Dawejko had to beat Enobong and get out of the 2300 Arena without any cuts or injuries that would prevent him from meeting Amir two months later. 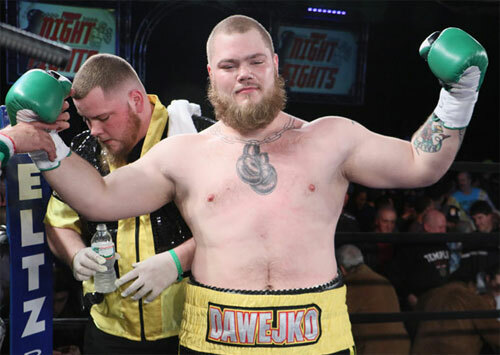 With Mansour at ringside doing TV commentary, Dawejko stormed out of his corner and clocked the hulking heavyweight with a picture-perfect Philly left hook. Umohette crashed to the canvas and was out cold after just 27 seconds. Joey raised his hands and smiled at Mansour. Amir smiled back. The stage was set for the bout that would become the biggest event of the year. Although this KO was quick, it was still was one of the most satisfying moments of 2015. 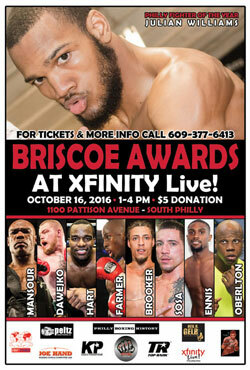 The “2015 Knockout of the Year” is sponsored by Philly Boxing History Inc.
Come out to support Joey Dawejko and the rest of the Philly boxing community on Sunday, October 16, 2016, 1-4 pm at Xfinity Live! In South Philadelphia. Admission is $5.